My edited volume, Crowdsourcing Our Cultural Heritage, was published, with a book launch at UCL. From September – December 2014 I was a Visiting Research Fellow at Trinity College Dublin / CENDARI project. 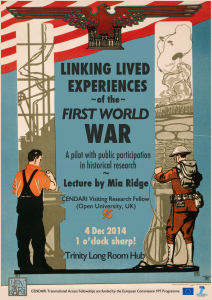 In December I presented on ‘Linking lived experiences of the First World War: a pilot with WWI collections‘ at the Trinity College Long Room Hub. In November 2014 I presented on Citizen History and its discontents for the IHR Digital History seminar series, launched my book, Crowdsourcing our Cultural Heritage at UCL then keynoted at New Zealand’s National Digital Forum with ‘Collaborative collections through a participatory commons’ (talking about the Participatory Commons). I was also in London for the Museums Computer Group’s UKMW14: Museums Beyond the Web. In October 2014 I gave a paper asking Where is the revolution in citizen history? The place of crowdsourcing in public history at the Public History in a Digital World: The Revolution Reconsidered conference in Amsterdam, ran a workshop on visualising collections at the Geffrye Museum and presented in an online seminar on ‘Crowdsourcing 101: Fundamentals and Case Studies’. In August 2014 I taught ‘Crowdsourcing Cultural Heritage’ with Ben Brumfield at the HILT Summer School (Humanities Intensive Learning + Teaching) at MITH in Maryland. In July I presented “Lightweight usability testing for digital humanities projects (AKA, ‘testing doesn’t have to be taxing’)” in the Introduction to Digital Humanities strand of the Digital Humanities at Oxford Summer School 2014 then I went to Lausanne to present ‘Play as Process and Product: On Making Serendip-o-matic’ at Digital Humanities 2014 with fellow alumni of 2013’s One Week One Tool. In May I was in Bristol for the Museums Computer Group’s Museums Get Mobile and in Boston for THATCamp NE. In April 2014 I was a keynote speaker at the 3rd international Sharing is Caring seminar. I spoke on ‘Enriching cultural heritage collections through a Participatory Commons’. In Feburary I was invited to Melbourne to give a keynote on ‘GLAM making’ at VALA2014 (VALA – Libraries, Technology and the Future), and spoke on ‘Bringing maker culture to cultural organisations’. In January I wrote a guest post for the Museums Association site: Digital myth: Museums need to explode the myth they are technologically backward. As part of my Visiting Research Fellowship at Trinity College Dublin’s Long Room Hub I gave a lecture on ‘A pilot with public participation in historical research: linking lived experiences of the First World War‘. The abstract and podcast are below, and there’s further information about my CENDARI Fellowship here. Abstract: The centenary of World War One and the digitisation of records from a range of museums, libraries and archives has inspired many members of the public to research the lives of WWI soldiers. But it is not always easy to find or interpret military records. What was it like to be in a particular battalion or regiment at a particular time. Can a ‘collaborative collection’ help provide context for individual soldiers’ experience of the war by linking personal diaries, letters and memoirs to places, people and events? What kinds of digital infrastructure are needed to support research on soldiers in the Great War? This lecture explores the potential for collaborating with members of the general public and academic or amateur historians to transcribe and link disparate online collections of World War One material. What are the challenges and opportunities for participatory digital history? A lecture by Visiting Research Fellow at the Trinity Long Room Hub, Mia Ridge (The Open University). Mia is a Transnational Access fellow, funded by the CENDARI project (Collaborative European Digital Archive Infrastructure).